"A delicious holiday breakfast. 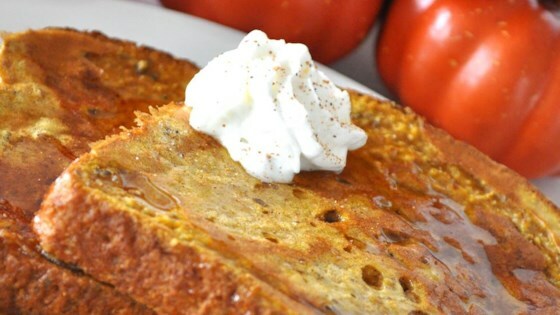 It's a wonderful spin on traditional french toast that measures up for any pumpkin pie lover. Serve warm with warmed maple syrup!" Heat a lightly oiled skillet over medium heat. Whisk eggs, half and half, pumpkin, cinnamon, vanilla extract, pumpkin pie spice, and walnuts together in a bowl. Soak one slice of bread at a time in the pumpkin mixture, then place in the prepared skilled. Repeat with the remaining slices of bread. Stir the pumpkin mixture between dips to keep the walnuts from settling. Cook the bread until golden brown, about 3 minutes on each side. Chocolate-stuffed French toast always wins brunch! These were great! One addition that I did, was to add 1 ts of brown sugar. Other wise everyone loved them! I like anything pumpkin flavored. These definitely made a delicious breakfast!